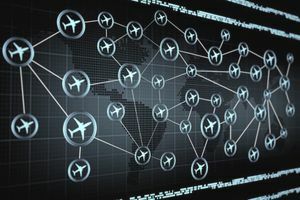 Air traffic control is a tough career field to break into, and for good reason: As Sarina Houston notes in The National Airspace System Explained, there are about 7,000 aircraft in the sky above America at any given time. Even setting aside the fact that monitoring our airspace is vital to preventing another major terrorist attack on the US, it's quite a task just to keep so many aircraft from smashing into each other on a good day. Add to that the challenge of overseeing flights destined for vital combat and transport missions at home, abroad, and in the middle of the ocean, and you've got a U.S Navy air traffic controller (AC). It's not easy to secure an enlistment contract as an AC, but it's a rewarding military career. And after retirement from the Navy, it puts you in a good position for a civilian job. Navy ACs man control towers at naval aviation facilities, including at U.S. stations, expeditionary airfields in war zones, and on board those magnificent floating cities, aircraft carriers. In each case, ACs "safely and effectively direct aircraft . . . control the movement of aircraft and vehicles on airfield taxiways, and issue flight instructions to pilots by radio," according to Navy Credentialing Opportunities On-Line (COOL). In addition to scanning the skies with friend-or-foe identification radar, Navy air traffic controllers help pilots plot their flight plans, and they map and track aircraft routes to avoid collisions. They also act as the pilots' eyes on the ground, managing takeoffs, holding patterns, and landings with guidance by radio. That's especially crucial in carrier landings when one false move means you're in the drink. Applicants must be high school graduates over the age of 18 and take the Armed Services Vocational Aptitude Battery (ASVAB), achieving a total combined score of 210 in general science, arithmetic reasoning, and a doubled mathematics knowledge score. A flight physical, normal hearing, and normal color vision correctable to 20/20 are also necessary. Navy air traffic controllers must have good verbal communication skills and high trustworthiness. Prospective ACs must pass a read-aloud test to confirm their ability to speak English loud and clear. As with many high-profile jobs in the military, ACs must also qualify for a secret security clearance. Due to the training and investment involved, first-term air traffic controllers must be enlisted for at least five years. The Air Traffic Controller Course for the Navy and Marine Corps, conducted at Pensacola's Naval Air Technical Training Center, consists of five months of intensive academic instruction and simulation that gets students up to speed on Federal Aviation Administration (FAA) controller standards as well as military-specific skills. Following graduation from "A" school, the future air traffic controller can look forward to a further year or two of on-the-job training at their first assignment, including lab, lecture, and individual training. The training varies in the details since air traffic controllers must be certified specifically for the facility where they work, as standard operating procedures and equipment vary from place to place. At the end of their military careers, ACs may apply for Navy funding to prepare for certification with the FAA as air traffic control tower operators and aircraft dispatchers. The GI Bill may also be used to train for the American Board for Certification in Homeland Security and the American Association of Airport Executives.